It’s been 15 years since the Tropical Rainfall Measuring Mission (TRMM) satellite was launched. Over that time, TRMM has significantly advanced our understanding of precipitation through measurements of the global distribution of rainfall at Earth’s surface, the global distribution of vertical profiles of precipitation, and other rainfall properties. As a result, TRMM provides clues to the workings of the water cycle and the relationship between oceans, the atmosphere, and land. But the benefits of TRMM extend beyond the research community. 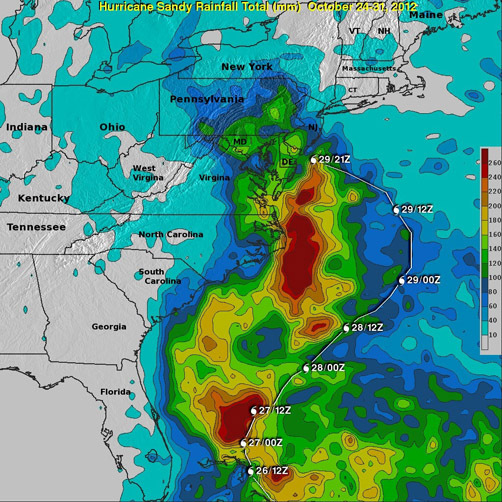 The image below exhibits the kind of operational data TRMM can supply: it’s a rainfall analysis of SuperStorm Sandy that reveals the heaviest rainfall totals during the storm (more than 10.2 inches) were over the open waters of the Atlantic Ocean. TRMM rainfall analysis for SuperStorm Sandy, with the storm's track over the Atlantic Ocean overlaid in white. NASA image. Despite its advanced age, TRMM continues to provide unique data; its enduring value is evidenced by the fact that more than 50 presentations at the AMS Annual Meeting in Austin are related in some way to TRMM and its data. A few examples: Yingchun Chen of the University of Melbourne will examine TRMM’s estimates of daily rainfall in tropical cyclones using the Comprehensive Pacific Rainfall Database (PACRAIN) of 24-hour rain gauge observations (Wednesday, 9:30 a.m., Room 10b). A poster presentation by Dana Ostrenga of ADNET Systems and NASA’s Goddard Space Flight Center will review the recently released Version 7 TRMM Multi-satellite Precipitation Analysis (TMPA) products and data services (Monday, Exhibit Hall 3). Zhong Liu of George Mason University will present a poster on the TRMM Composite Climatology, a merger of selected TRMM rainfall products over both land and ocean that provides a “TRMM-best” climatological estimate (Monday, Exhibit Hall 3). In her poster, Hannah Huelsing of the National Weather Center will show how TRMM 3-hourly data were used to look at the spatial and temporal distribution of the Asian premonsoon and monsoon seasons in Pakistan during 2010’s severe flood year (Tuesday, Exhibit Hall 3). As TRMM matures, it’s also broadening its horizons and crossing disciplines. Earth-observing systems are increasingly being utilized in the field of public health, and in Austin, the Fourth Conference on Environment and Health will include a themed joint session on this budding partnership. In that session, Benjamin Zaitchik of Johns Hopkins University will discuss the modeling of malaria risk in Peru (Monday, 5 p.m., Room 6b). Zaitchik and his colleagues modeled the influence of land cover and hydrometeorological conditions on the distribution of malaria vectors, as well as the relationship among climate, land use, and confirmed malaria case counts at regional health posts. In the study, meteorological and hydrological conditions were simulated with the use of observations from TRMM and other satellites.